After too much cycling with my brother (yes, that is a thing), we decided to take a break however, our idea of a restful day somewhat differs so after failing miserably to survive in Fortnight and somehow managing to cause a glitch in the game, I decided to leave my brothers to carry on with that while I knocked up some goodies in the kitchen – a far more relaxing experience. In an attempt to satisfy everyone’s tastebuds and avoid braving the cold, it had to be something vegan, tasty and using only basic store-cupboard ingredients. Introducing chocolatey, gooey, fudgy blondies made of, wait for it… chickpeas. This recipe is so easy. You just bung everything in a blender then let the oven work its magic. The timings in the recipe are not a typo. You really do leave the mix in the oven for an hour. The idea is the low heat and slow bake result in a fudgy dense consistency. The peanut butter and chickpeas give the cookie bars an unsurprisingly but extremely welcome nuttiness. Studded with dark chocolate chips, this bake is totally vegan and totally luxurious too. Bake for 60 minutes or until a toothpick comes out clean. This will vary with ovens so be patient and wait until the edges are beginning to brown. An extremely tasty, flavourful dish that is just as good cold as it is warm. If you like peanuts, this one is for you. The fresh ingredients deliver vibrant, aromatic depth which tastes great with the creamy nuttiness of peanuts and coconut. I have left the seeds of the chilli in and used medium curry powder for a little punch but feel free to remove them if you want it mild. No oil is needed for frying. The vegetables are lightly blanched with the noodles and the chicken is grilled on skewers. This recipe makes enough to serve 2 as a dinner but you could double the amount of chicken and the noodle ingredients as there is enough satay sauce to serve 4. I have suggested freezing half the satay for another time but why not double up and have extra for a proper tasty next day lunch? Add the ginger, garlic, lime zest and juice into a bowl. Add the honey, soy, curry powder, chilli, creamed coconut and peanut butter. Give it a good mix, adding a small splash of water if it’s too stiff. (At this point, half the mix and freeze one half for another time). Spoon two-thirds of the remaining mix into a small pan. Set aside for Step 3. Cut the chicken into strips, tip it into the remaining third of the peanut-butter mix then stir well. Cover with cling film and chill until required. While the chicken is marinating, heat the satay sauce mix. The sauce needs to be heated gently and stirred. Add a little water to loosen if needed. Thread the chicken into ‘S’ shapes onto the skewers. Heat the grill to high and line a baking tray with foil. Line up the skewers on the tray. Grill the skewers for about 10 minutes, turning occasionally, until lightly charred. Remove from the skewers and set aside. While the chicken is grilling, break the rice noodles up into a heatproof bowl and cover with boiling water for 5-10 minutes. When the noodles are nearly cooked, add the carrots and mange tout to the bowl. Leave for 1 minute to warm through and soften slightly then drain and add back to the bowl along with the spring onions and coriander. Add the satay sauce to the noodles and mix thoroughly with two forks. Serve onto plates and top with the marinated, grilled chicken. I love coconut and I love peanut butter so why not smoosh them together into an awesome creation of tasty, sweet, chewy, nutty, rich goodness? There is no reasoning. It needs to be done. Preheat oven to 180C and line cookie sheets with parchment paper. This is a must! In a large bowl, stir together the flour, coconut and salt. In a separate bowl, combine the peanut butter, sweetened condensed milk and vanilla. Pour mixture over coconut and use your hands to combine. Spoon balls onto the prepared cookie sheets. Cookies should be about golf ball size. Bake for 12 to 15 minutes in the preheated oven, until the coconut is toasted. For the drizzle, chop the dark chocolate into a small microwave safe bowl. Microwave in 30 second increments until melted, stirring in between. Using a fork, drizzle the macaroons with the chocolate. Let chocolate set or speed it up by placing in the fridge for a couple of minutes. I love these served at room temperature. They are the perfect pick me up with a cup of coffee. I love bananas and I love peanut butter even more. Blended together, they make a fantastic smoothie that is cheap, easy healthy and extremely tasty. The bananas are frozen before blending to give an almost ice-cream like creaminess with none of the fat or sugar to worry about. Possibly my shortest recipe to date (if you can call it a recipe), this is a perfect cooling treat for a sunny afternoon. 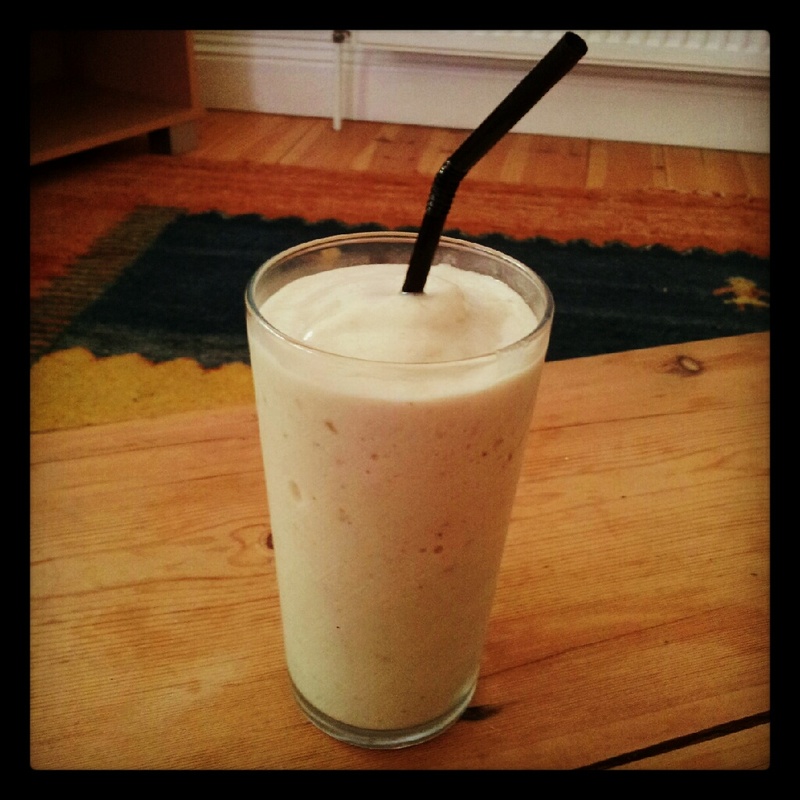 Add the frozen banana slices, peanut butter, salt and milk to a blender and blend until smooth and creamy. Add enough milk to help the banana break up but not so much that the mixture becomes really runny. You want the smoothie to be nice and thick. Pour the contents into glasses, stick straws in and enjoy! Preheat the oven to 180C. Grease and line the base of a 20cm square tin with greaseproof paper. Pack the mixture firmly into the prepared tin and bake for 20-25 mins until just turning brown at the edges. Allow to cool in the tin. 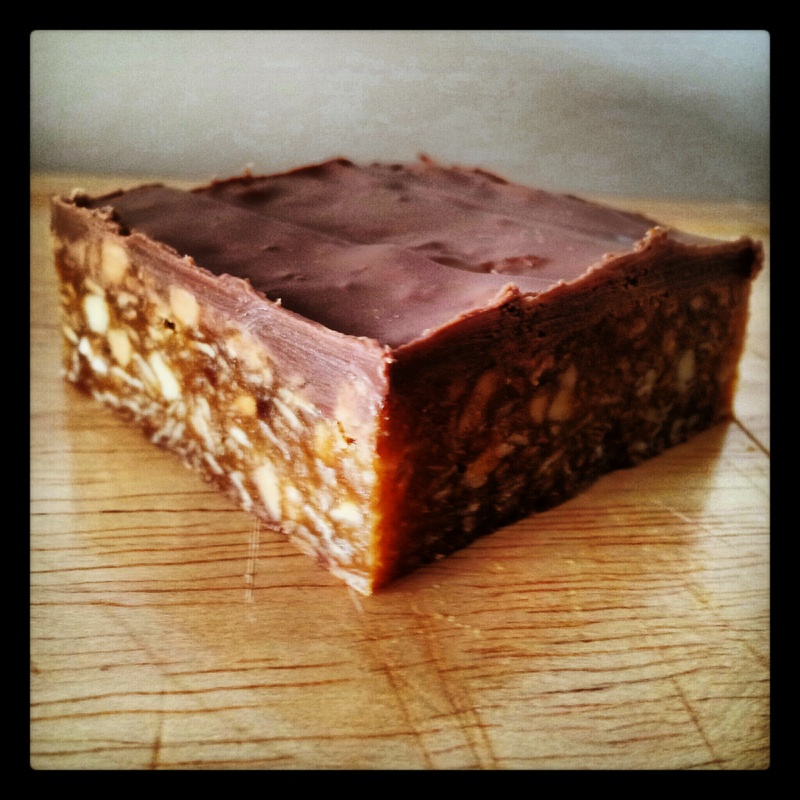 Break the chocolate into squares and place in a bowl over a pan of gently simmering water. 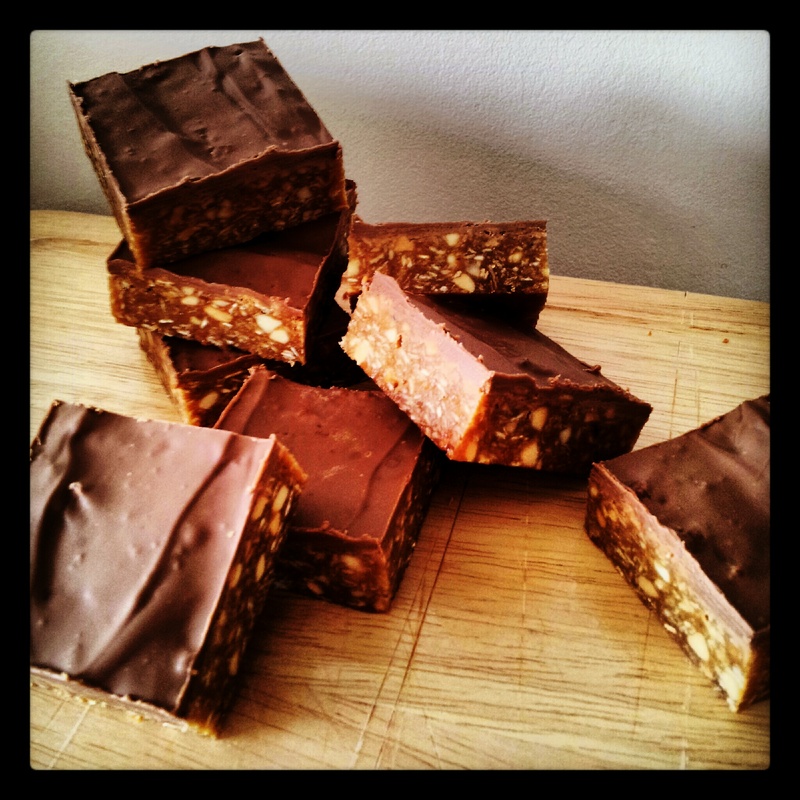 Allow to melt, then spread over the cooled flapjacks and allow to set in the fridge. Cut into squares. Eat. These flapjacks, as with pretty much all flapjack recipes, are much better after a couple of days of keeping. I don’t know why, they just are. So if you can resist buttery, chunky, peanutty, creamy, chocolatey goodness for just a few days then you’re in for an even greater treat.